মোদের গরব, মোদের আশা, আ-মরি বাংলা ভাষা - অতুলপ্রসাদ সেন If your device can display this sentence in Bengali perfectly, then your device supports Bengali and Swarachakra should also work well. If you do not see any text, or if some of the words are incorrect, Swarachakra may not work well. The security report shows that this application is safe. Swarachakra Team, IDC, IIT Bombay has developed the app that lies within the Communication category. 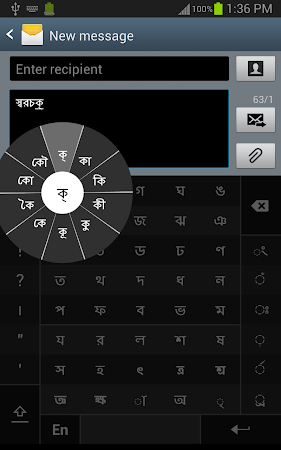 Google Play displays that Swarachakra Bangla Keyboard is rated 4.3 by its users. This application has been downloaded and set up by over 1M users and the most recent update was released on Sep 4, 2014. The statistics show that the app is popular mostly among Samsung and Micromax users. Take the opportunity to get the .apk installer of Swarachakra Bangla Keyboard 2.01 free of charge and check out users' reviews on Droid Informer. This installer takes up 607 KB of disk space and it runs on Android devices 4.0 and above.